“Carpe Mortem”…. reads the title of this post. It is certainly not a popular or well-received saying for that matter. The phrase definitely has its share of negative connotations, and this past week I stumbled upon an interesting comedy clip, Don’t Fear Death, that defies the typical responses to mortality and instead glorifies the concept of death! 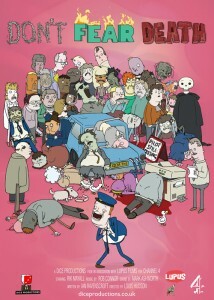 Courtesy of Dice Productions, this twisted humor features a male narrator who boasts of the benefits of dying. The narrator claims that with death comes freedom and the lack of responsibility. His obsession with death essentially implies that the fear of death is irrational. Although he aims to present his views in a positive light, the video clip is riddled with dark imagery, which does not necessarily seem like a strategic way of convincing audiences that death is as glorious and advantageous as the narrator perceives it to be. Every scene displays human corpses, bodily fluids, and there are also multiple appearances from Grim Reaper. However, this is an animated clip, so this imagery somewhat adds to the underlying humor of the overall story. It also decreases the affect that the concept of death and this perceived glorification may have truly had on general audiences if, say instead, real humans had been cast to portray the narrative. At one point during the clip, the narrator questions our innate fear of death, and then proceeds to answer. Humans are “wary of that bright light and scared of the unknown.” Yes. This is certainly true considering the fact that generally as a culture, death is inevitably stigmatized and talk of it can be unsettling. That being said, humans are instinctively apprehensive of what awaits them: the nature of the death process, what it does to our bodies, how it affects the survivors, as we talked about in class, and how we, as a society, perceive death from that moment forward. Humans do not have control over such a phenomenon, which, in turn, can be frightening. The end of the clip is comical and features an unexpected twist. The viewers discover that the male voice is that of a flight attendant on a plane, full of passengers, and that the plane has actually caught on fire. When the flight attendant concludes his unusual and for all intensive purposes, disturbing banter about the wonders of death, he is met with a silent and disapproving reaction from the passengers, who are also distraught about their life-threatening situation. Frustrated, the flight attendant takes the last available parachute, and he himself escapes death and lands safely, leaving the poor passengers destitute. I am completely certain that the flight attendant is in denial of death. It is amusing that the he had never experienced death, but interestingly enough felt it necessary to speak so highly of the concept of death. Perhaps a logical explanation for his behavior was that he was unsure of how to confront the issue of death that soon awaited him. Maybe he wanted to convince himself to accept his fate, something he probably still feared even though he claimed otherwise. The fact that he selfishly left the passengers and escaped contradicts his entire argument that death is not the curse it once was. I believe that the writer chose to end the clip this way to reinforce this idea of mocking the public’s fear of and reactions to death. In all, the social implications of death, as illustrated by the flight passengers and ironically the actions of the attendant himself, demonstrate that culturally, there is much discomfort when dealing with and engaging in discourse concerning death. Eating your way out of your grave sounds like something from an old kooky horror television show like Buffy the Vampire Slayer; in renaissance Venice, it was a terrifying reality. According to folklore, a corpse-turned-vampire would chew its way through its funerary shroud and emerge from the grave as a fully-fledged “traditional” vampire. The only way to defeat the vampire was to wedge a brick in the corpse’s mouth to prevent it from chewing. This particular myth of the vampire was perpetuated by the plague in the 16th and 17th centuries. Plague victims were buried in mass graves; when another person died, the grave was reopened to add their body and once opened, the gravediggers met with a very unfortunate surprise. The corpses already inside the grave seemed to have already attempted to eat themselves out; the shroud covering the mouth had been worn through and stained very dark. 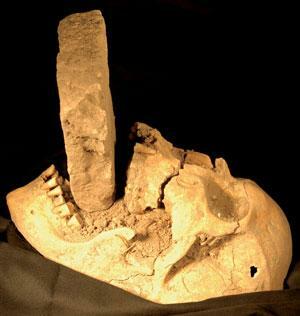 The terrified grave diggers would shove a brick into the “vampire’s” mouth to make it unable to chew and then re-bury it. Had the shroud been stained by the draining blood that the vampires had drunk before being buried? Not really. This dark stain was caused by a fluid created from the decay of the gastrointestinal tract contents and lining that had then poured out through the nose and mouth. The worn cloth was the result of putrid gases and moisture produced by the decaying corpse. Even the gaping mouth is natural. Everything that made the corpses “vampires” was really just the normal process of decomposition. The superstition surrounding these particular vampires resulted from a misunderstanding of the process of decay. In whatever time you live in, digging up a grave and exposing a bloated corpse with a black gaping chasm in place of its mouth would be terrifying, but at least now we have the medical knowledge to understand that the corpse has only undergone natural processes of decomposition. Without our modern information though, how would you possibly explain this horrible discovery? People had to come up with a reason of why this corpse was so terrifying. Postmortem changes such as algor mortis (the cooling of the body) and rigor mortis (the temporary stiffening of the muscles) were known at this time but the corpse was usually interred in the ground while they were still in effect, especially if it was the body of a plague victim. Naturally then, the corpse had to be alive to move. The fear of these “vampires” embodies our fear of the corpse. As a quasi-object, nothing is really definite about the corpse, except that it is dead. So when a corpse comes back to life, our world turns on its head because now we don’t know anything for certain at all. That death was apparently not permanent prompted thoughts of evil or Satanic involvement. Since 16th century Italians were strongly Christian, the Devil’s interferences in the human world were real and terrifying. Vampire folklore is not peculiar to 16th century Venice. Other “vampire burials” have been discovered by archaeologists in places like Bulgaria, Poland, and even the Greek islands. Many of the old cultures of Europe as well as around the world have their own version of the vampire. They all also had their own ways of dealing with them. Bulgaria, for instance, buried their vampires with iron stakes through their chests (read more here: http://archive.archaeology.org/1209/trenches/sozopol_bulgaria_black_sea_burial_skeletons.html). Did all of these cultures come up with the idea of a vampire based on the misunderstood decomposition of the corpse? Or is it simply our imagination running away with the personification of our fear of death? but it doesn’t go well for her…. She eventually gets possessed by some demonic spirit. This transition from a young, living girl to a possessed demon-girl was interesting to me because while she’s still alive, her body seems to be decaying in the same way a corpse decays. Why is it that demonic possession is frequently manifested in the rotting of the body? By associating the dead body with the demonic body, there seems to be a sort of implicit judgment of the dead body as having a deep connection to Satan or demons. The dead body is unholy and thus possession manifests itself through turning the host body into a corpse. made me think more about the relationship between possession and death. The girl in the movie seems to no longer occupy her body, as seen when she says that Mia is no longer there. This reminded me of the saying, “S/he’s in a better place now” in that the body is thought to no longer contain the person’s soul. So, much like the dead body, the possessed body no longer contains the host soul. In addition, my reaction to the sexualization of the possessed body seemed to parallel my reaction to necrophilia. As something that no longer exists in an easily categorized plane as living or dead, the possessed body seemed to function as something that cannot give consent. The sexualization of something that physically resembled a corpse made me uncomfortable, something that the makers of the movie wanted. Imagine, you receive an invitation to a party. You open it excitedly and the first words you read are “let’s talk about death”. Your automatic response is to quickly throw the invitation out, but this is a new trend that has begun over the last couple months.People have begun to gather their friends and family to have dinner and talk about death. Morbidly nicknamed “Death dinners”, the idea for this trend was born in a train from the conversation between two doctors and University of Washington professor Michael Hebb. Upon learning that 75% of Americans want to die at home, but only 25% do, and that most bankruptcies are due to end of life medical fees, professor Hebb decided that action needed to be taken to fix this and that the solution was no more than a difficult conversation. And what better place to have a difficult conversation than over the dinner table. Naming his project “Let’s Have Dinner and Talk About Death” Hebb, along with some UW students, started reaching out to health professionals and to their loved ones to start these conversations about death. In our American culture death is not something we feel comfortable talking about. We fear death and do almost anything we can to put it off and ignore it. The idea behind Death Dinner is to force us to face our own mortality and imagine the process by which we die. Due to the rising amount of deaths due to chronic illness and the fear of life support sustained lives, these conversations are vital to have with those who will someday take on responsibility for us. In Hebbs TEDMED talk he pushes that these dinner parties should discuss three big questions: a) how do I want my final days to end? b) who do I want around me? and c) are my family and friends able to support and respect my choices? Aware of the taboo around these topics, Hebb took his idea to the next step, he made an instructional website. The website http://deathoverdinner.org/ provides a step by step process for creating the perfect death dinner. It provides options for dinner guests, for the intention behind the party, recommendations for pre-dinner reading, conversation prompts, post-dinner next steps, and even an invitation for your guests. The only thing the user needs to provide are dinner, their thoughts on death, and a good helping of courage. These dinners are tough, they access our fears and make us understand our mortality, but they are the first step in starting a conversation that no one is having. They are a first step to increasing the number of people with living wills, to ensuring that people are dying in the manner they choose, to reducing the number of people dying in hospitals and hospices. At the moment, though, Death Dinners seem to be a trend among the educated, upper middle class, and wealthy. The question is, how do we spread the conversation to those who need medicare or who don’t have health insurance? These are the populations that face the most hardship in the costs of dying. Hebb’s Death Dinners are a great idea that will hopefully progress through classes, cultures, and generations. Death is something that happens to all of us, and while it’s scary and not something we want to think about, making sure that we ourselves and those around us understand our wishes for the end is important. For more information check out both Hebb’s website and his TEDMED talk bellow. Look at this page, it’s on tumblr. This person makes porcelain figures of young, beautiful, 19th century-looking women with organs or their heads in their hands. This reminds me of our discussion of the idea of death being mixed with sensuality or beauty in the 17th and 18th centuries. The best way that they seemed to have represented this was with young women of a marriageable age coming into contact with the personification of death, or sometimes being that personification of death. These porcelain figures bring this gruesomeness of death and adds it to these beautiful women, who seem to be the picture of femininity. What are y’all’s thoughts on this? What message is this sending? and is it a good one? Does it speak to some nonchalance on our part about death? Does it discredit or support our pairing of beauty with death? Seems almost zombie-like to me. 1000 Ways to Get Comfortable with Death? Although these videos may make us cringe with the imagined pain of the victims, we find it ok to laugh, because we know they’re going to be ok. Maybe badly hurt, but alive. Laughing at their death would just be cruel. With this in mind, why do we allow ourselves to laugh at the foolishness of people on 1000 Ways to Die? Is this ethical? I argue that the answer comes from the clever words of the sadistic narrator. Since the narrator makes each death seem like the victim’s fault, we find it ok to laugh at them – after all, they deserved it. Their poor decisions justify the punishment, and we can justify our laughter. Although 1000 Ways to Die does not present death in the most graceful or respectful manner, I support it’s presence on TV simply because it gives death a presence. Many Americans are fearful and unfamiliar with death. 1000 Ways to Die uses humor to lighten the sober theme, a clever trick to make viewers comfortable with the topic of death. For those uncomfortable with the disease-stricken and war-torn bodies on CNN, I suggest giving 1000 Way to Die a try. I recently just watched the Tim Burton movie The Corpse Bride and it got me thinking about the two worlds of the living and dead that Burton had created in the movie. What is interesting in this movie is the stark contrast between the world of the living and the world of the dead. The world of the dead is colorful, full of raucous jazz and laughter and is almost poking fun at the way each person died by making jokes about a man cut in half, the head of a waiter, etc. etc. And the way the Corpse Bride was betrayed and killed by her lover is made into a fantastically fun song that a skeleton named Bone Jangles sings. Comparatively, the world of the living is black and white and filled with organ music. The living appear more dead than the dead, with their sunken-in eyes and grey lips. This is a story where the dead have this life in them that the living lack. The world of the living is restrained and limited, dark and grey, whereas the world of the dead is raucous and fun, jazzy, bright and coloful. I know, it’s a spider and maggot telling her how special she is, BUT the message of the song is that she can still feel and do everything a living human can except breath (and she’s rotting, of course). She is still seen as beautiful and mostly marriageable and Victor promises to marry her. Of course this is post 17th and 18th century so Victor can’t be married to a dead person, but has to kill himself in order to be with her (so no real necrophilia here) and eventually Victor and Victoria do end up together so it’s living with living and dead with dead as it should be. Still it has that same sensuality of death that was beginning to be represented in the 17th c. then carried on to extremity in the 18th c.
CNN health highlights the tragic case of Karen and Jim Garner. Jim was diagnosed three years ago with early onset Alzheimer’s disease. He was 48. Now, after having to leave his job and move home, Jim struggles through the day fighting to complete everyday tasks. The father of two laments that he is only good for doing household chores. His wife Karen agrees. As horrible as that sounds the financial, emotional, and physical burden on caregivers is excessive, especially when the caregiver is a relative. When Jim lost his job, Karen needed to return to work full time. Despite the security of a full time job, Karen earns less than half of what Jim did. She also has not started paying for caregiving for Jim. She is currently his full time caregiver as he retains enough cognitive ability to be left alone. However, his mental state will eventually deteriorate to the point that full time care, not covered by insurance, is a necessity. Not only is there no subsidy for Jim’s future care, there is no way to replace the loss of his financial contribution. A patient in healthy condition otherwise could live decades after diagnosis. How can a family of four living on one salary provide full time care on top of daily expenses? Caregiving is also extremely emotionally taxing. As each day progresses, so does the disease. For the caregiver, and in Karen’s situation, the spouse, it is horrific to watch the daily deterioration of your loved one. Karen laments that her children ages 9 and 12 will never know the great father Jim was. Jim is also increasingly distant with the children. While physically he is there, his wife and children may have already emotionally lost him. It is difficult for Karen face Jim’s impending deterioration and death, but the emotional burden has clipped her once optimistic attitude into one that would rather the family just got it over with quickly. Once Jim deteriorates enough, he will require full time physical care. These burdens often fall on spouses and children who give care after the hired help has left. Here are some caregiver burden statistics: http://www.oakleafmedical.com/hv/2010_sp/graphics/dementia_chart.gif. This problem of caring for patients with Alzheimer’s and dementia will only get worse. With an increasing and aging population, these diseases are expected to affect 115 million people by 2050 and the costs for patients in the US alone will rise to $1.2 trillion. How can we care for our ailing population AND their caregivers? Are we in fact creating a new emotionally and financially ailing population of caregivers? At the recent seminar, one of the concepts that I found interesting was about the effect of social media on death. As technology advances, social platforms such as Facebook and Twitter improve the means for people to contact and reach out to each other. The effect of media can be both positive and negative. One effect that we can see clearly is the returning definition of death as a social event. In history, death was a more public social event. However, after we were able to learn more about death and even interfere with it, death became the symbol of defeat, grief, and a horrible destiny that many people wish to avoid. The following article “How social media is changing the way we approach death” (by Paul Bisceglio), using Scott Simon case as example, talks about the positive effect of social media by making death a public event. According to this article, near death people who suffered from terminal illness and their relatives can find comfort and happiness from their “followers”. When you are lying alone in the hospital bed, unable to sleep, how nice would it be to receive support from hundreds of people from all over the world? Bisceglio also points out that this publicity on death would give other people the real information about near death experiences so they can be more prepared for their future. As you comment on Facebook of someone who has passed away, you will be able to share the sympathy and feeling about the person who is dead and think about your own future. The “followers” might feel that they also hope to receive the same support and comfort when their time comes. The interesting question to me is that how people have suddenly changed from the perception of death as an unfortunate, private matter to an encouraging and public event. Maybe it is again, the cultural changes that influence death. When we weren’t able to do anything about death in the past, we were able to accept and prepare for death. Now, when we encountered terminal diseases for a long time and have not figured out a way to “conquer” them, people start to accept the unavoidable death again. This kind of acceptance spreads even more rapidly thanks to the network of social media. Social media doesn’t affect death only in a good way. Although, we are returning to the ancient concept of death as a public event, now the scale is much larger. A town public event is nowhere similar to a global public event. And the media network has the power to give death its global appearance. One of the new problems that social media brought to us is the new concept of “haters”. Especially in celebrity’s cases, in their death and near death experiences, there can be many hurtful comments and opinions that deepen the pain in that person as well as in their families. I have seen cases where people create fake Facebook pages to take advantages of the dead by pretending to raise fund for the family of the dead person. This lead to the question of how much death can be a public event? At what point should we share our death experiences with others?